I apologize for being gone so long, but I return with a blast, in form of a Quality Cult Cinema exclusive. Before Criss Angel, David Blaine and Darren Brown; when David Copperfield making the statue of liberty disappear was the world's most amazing act, a British fellow named Simon Drake came along and shook the world of magic. His show was the very first to suggest that magic could be something more than simple parlor tricks and manicured "ta-da" moments with cute bunnies and flowers pulled from a hat. It was the first show to cater only to adults, and featured a distinct gothic style which kept the audience trembling between morbid awe and disgusted amazement. 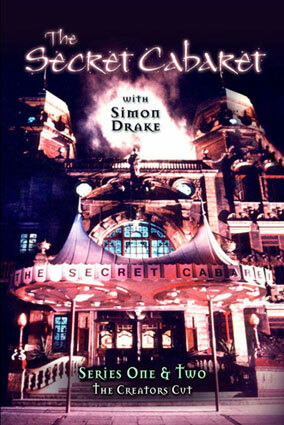 The Secret Cabaret was more of a variety act, and sometimes all out freak show, than the sensationalist performances of his peers. Often more grotesque than magical, in addition to Simon Drake's gory numbers, each episode showcased a selection of vampires, contortionists, knife jugglers, swindlers, midgets and ghost hunters. One of the guest performers was Frank Abagnale, who later attained world fame through Leonardo DiCaprio's depiction of him in Catch me if You Can. The tone was set right at the intro, when a giant spider with a human head giggled in his web, accompanied by perfectly mischievous music and outlandish freaks tumbling about in wonderfully weird costumes, within a haunting mansion that framed the eery atmosphere. Today, some 22 years later, while certain segments might look somewhat dated, overall it is still truly amazing to behold. Hugely influential, the show had tremendous impact on the entertainment industry, and aside from the aforementioned David Blaines and the likes who can attribute much of their success to the show, several obvious inspirations are to be found in the movie Lord of Illusions, and many others. Whether you've never seen a magic show before, or are practicing magic yourself, The Secret Cabaret is essential viewing for anyone who appreciates outristic art. As a magician I really love this. Wish there was a way to watch the full shows. cool, do you perform professionally, or is it just for fun?